We understand that pets are members of the family, and laying them to rest is an important part of the grieving process, and gives a sense of closure so that the pets' people can begin to heal. We want to help. The Hoegh Garden Memorial Urn is constructed of high impact styrene plastic and is an inexpensive alternative to a casket. The text and image shown on the product above is not included in the price. 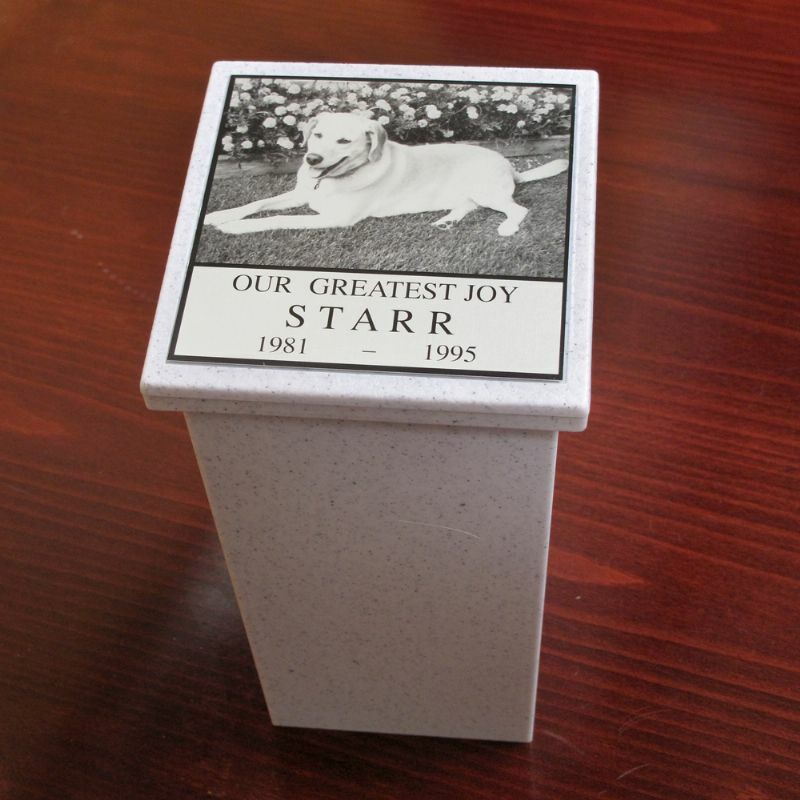 If you are interested in customizing your Garden Memorial Urn, please email sales@petsinremembrance.com. The Garden Memorial Urn is a speckled gray color with a textured finish and is attractive enough for indoor use. We are pet people, and we know how difficult the passing of a pet is. We just want to make this difficult time a bit easier for you and your family. 7" x 3.75" x 3.75"
In 1966, Dennis and Jeanne Hoegh of Hoegh Industries became pioneers in the pet casket business. Hoegh pet caskets are vacuum formed out of high-impact styrene plastic. They are available in eight sizes and 21 styles. In addition to the pet caskets, Hoegh Industries produces five pet cremation urns, the Remembrance Plaque and the Remembrance Memorial.